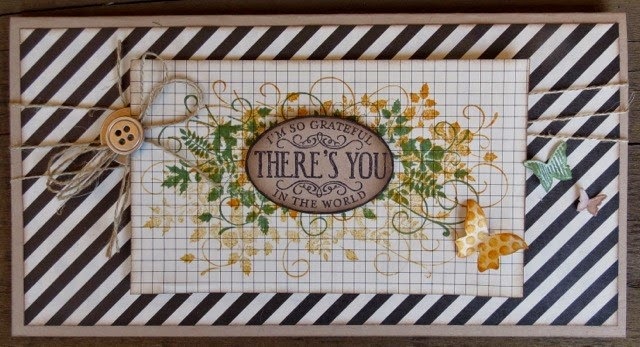 A very warm welcome to my first guest designer Megan Gourlay. I have always admired Megan's beautiful creations. She has an amazing eye for detail and produces some exquisite work. Look at this beauty of a card! I love how Megan has punched a circle, layered a snowflake and layered again on top of that. Her use of the the 1/8" Taffeta Ribbon is very clever. Faux stitching around the edge of the paper creates a nice detail. 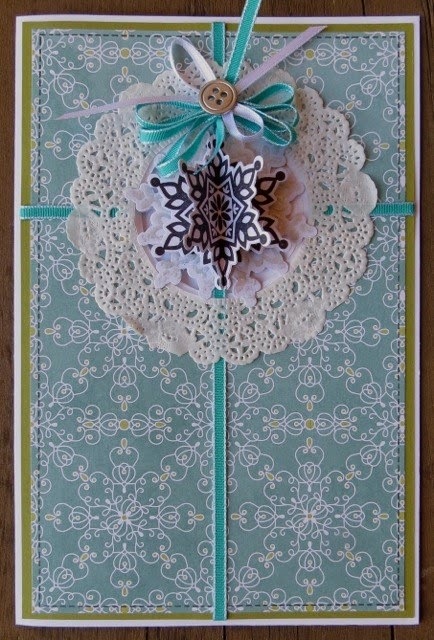 (SU products: card is whisper white and Old Olive, silver metal button, All is Calm paper, Doily, 1/8" Taffeta Ribbon in Bermuda Bay, snowflake stamp and die (retired)). In this second creation, Megan has used a stamp from the 'Seasonally Scattered' set and teamed it with a Chalk talk stamp. Very creative I thought. The paper is typeset (LOVE this range). I love the wrapped around linen thread too. Also used is a silver metal button and the beautiful wings embosslits.